Since there's no particular order in a wander, I might as well start with my favourite picture. 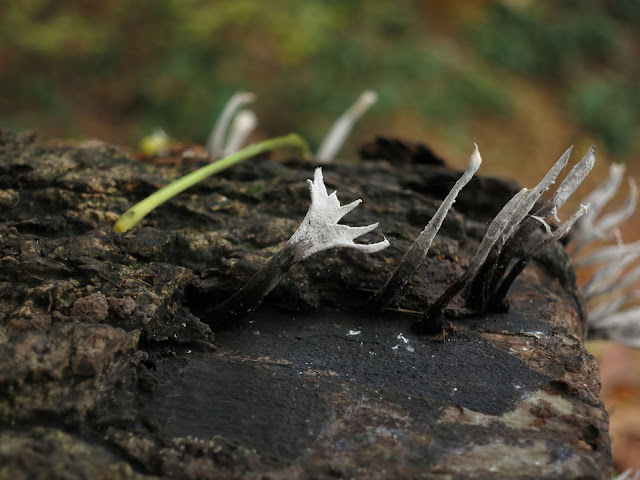 It's of Candlesnuff Fungus (Xylaria hypoxylon). 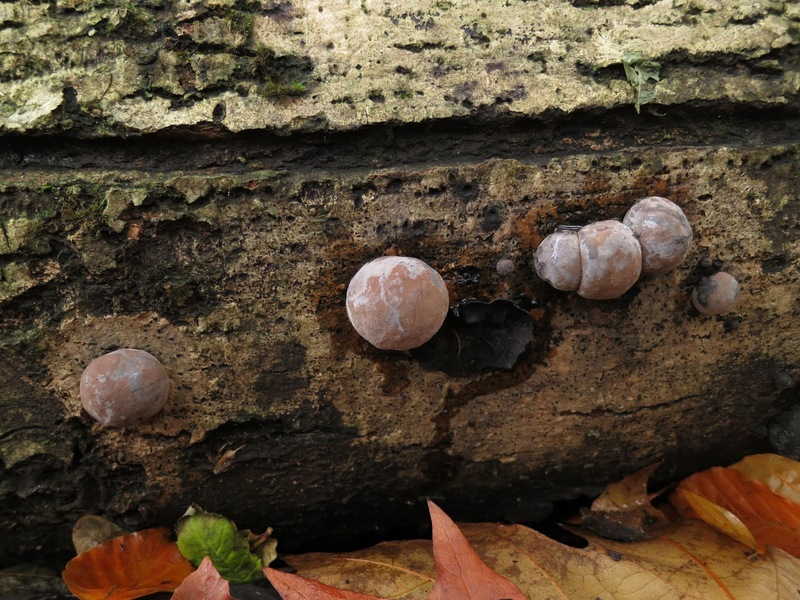 A long time ago, in another part of the wood (14th November 2009) I came across what looked like burnt chestnuts on fallen twigs. I didn't, then, know what they were. I may now. (Slow cooking, this blog!) . . . 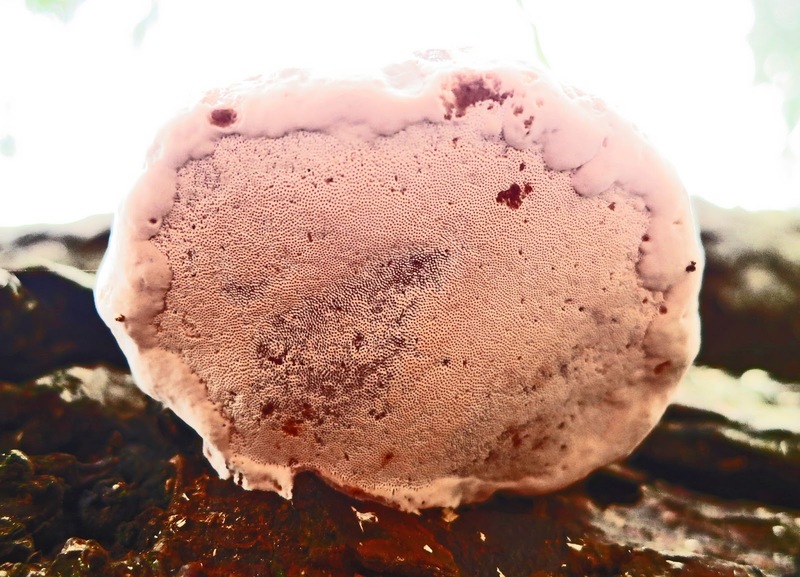 If you have been reading Loose and Leafy over the last few years, you will know I give fungi new names. Not only do I find my names easier to remember than those invented by others, it means no-one will be tempted to use this blog as a sure and certain route to identifying them. So, for me, these are Continental Chocolates. But, it turns out they are really . . . King Alfred's Cakes (Daldinia concentrica)! Sometimes, things are confusing. What is what? Lumps on bark of living beech. 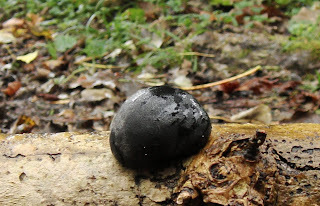 There were lots of these lumps on Beeches - on some trees more than others. 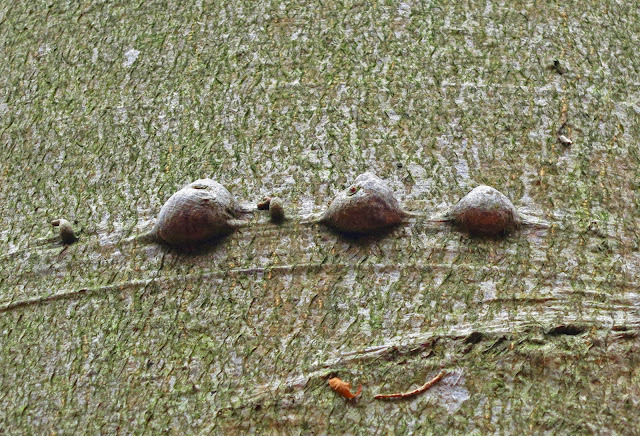 As you can see, they seem to be pushing up, alien style, through the skin of the trunk. This picture was taken from the ground and the little lumps were at quite a distance from the lens but they are clear enough to get the idea. I'm assured these are not fungi and have been given the suggestion that beech bark damages easily so this is some kind of . . . of . . . something that gets in . . . a bacterium . . ? I don't know. Whatever it it, it seems odd for there were masses of them and all in lines . . . how did apparently healthy trees get damaged to this degree? It's a hard life, being an amateur and an ignoramus. 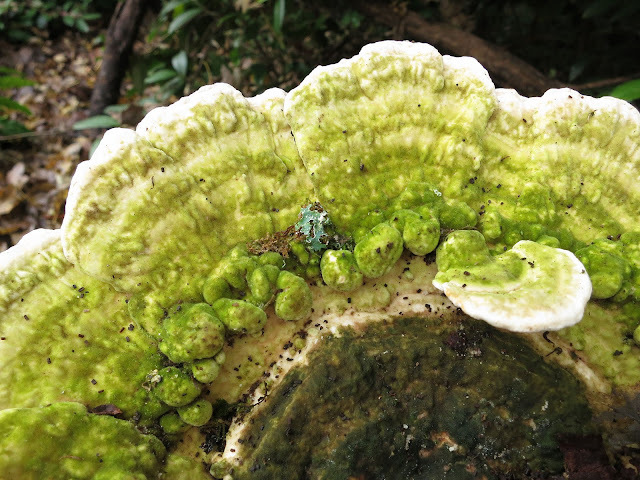 This post would have appeared much sooner if it hadn't been for the next fungus.. This last picture (the one below) is of Lumpy Bracket (Trametes gibbosa). And Visual Fungi is a good site too. You do find some interesting things Lucy. It's much easier to recall your own names rather than the Latin, though I understand the need for those too. the lumps on the beech? Galls? From wasps? tht green sure is pretty on the last one!! Excellent photos - love the candlesnuff one, we have found it all over the place this year. Funny thing is not much of the King Alfred's Cakes. What an amazing selection of fungi. I love the names you have given them! So happy to have found your delightful blogs of woodsy things, arts, stones and seasons and such. Your Continental Chocolates and Hoof Fungus work for me! 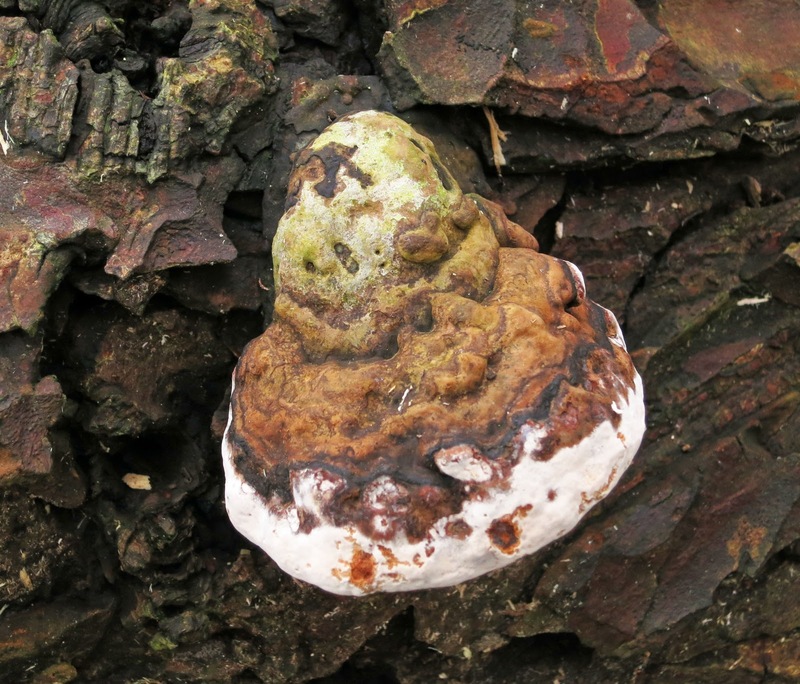 What amazing shots you have gotten, usually since fungi grow in darker spots they are hard to photograph. Is that one really so green, oh I love it. How wonderfully clever to name your fungi...I have been so interested in fungi and so I thank you for the website resources...you have some amazing ones there. I do like "dragon scales" quite a bit. Curious about that Beech tree. Beech warts? I'm interested to know what that is. Candlesnuff Fungus sounds like such a cool name. I've photographed that fungus before but not very well as it's so tiny. I never knew it's name but I don't think I'll forget it now. Hello Everyone! I'm not forgetting to reply. Well, I was forgetting . . . but now I won't . . . and will return! Hope you are all having a great festive season.